Built to last and stylish enough to complement any workplace, CORCAN MetaFlex workstations are an attractive choice for adding visual appeal without sacrificing durability. 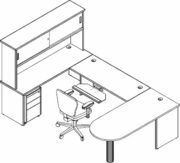 Space efficient and highly customizable, the MetaFlex line delivers the flexibility to meet the ever-changing demands of the modern office. Thanks to a unique legging system, MetaFlex components can be combined to create workstations that fit any need. Run-off tables can be positioned in any orientation, while curved lines and rounded corners are user-friendly and preferred by interior designers. When it comes to storage in the workplace, good ideas go a long way. That’s why so many customers appreciate the overhead hutch units available with the MetaFlex line. Tucked neatly beneath the desktop, MetaFlex mobile pedestals combine efficient storage with access to documents, office supplies, and personal items at your fingertips. 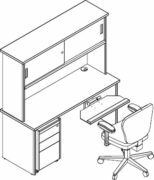 As with all CORCAN office furniture lines, the MetaFlex workstation can be custom-ordered to fit seamlessly into any office environment. CORCAN design and manufacturing professionals will be happy to help you create the MetaFlex solution that takes your workplace to new levels of performance. Contact us today about equipping your office with CORCAN MetaFlex.